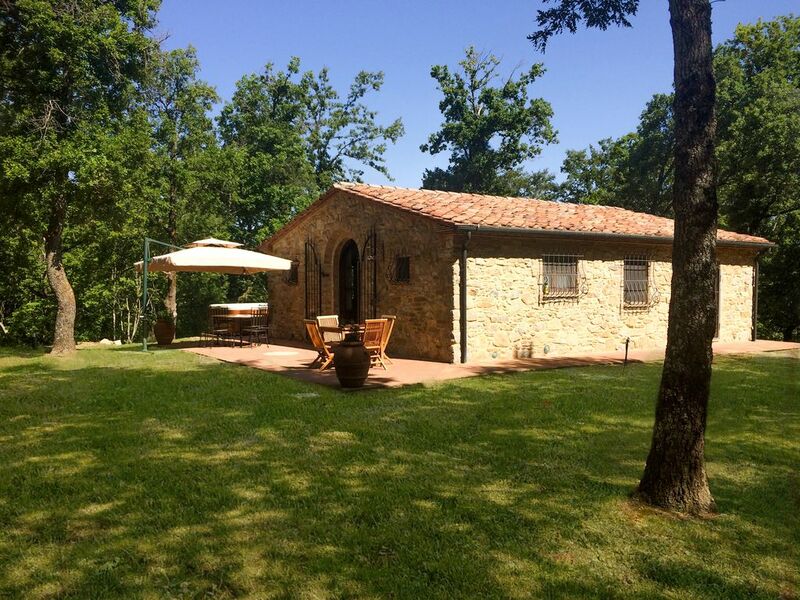 This splendid restored hay-loft situated in Radicondoli, Anqua, near Siena (40 Km) is ideal for people who look for a little peace and quietness in nature. It lies on the naturale reserve of the "Carline hills" in the Tuscan region. Originally it was an ancient hay-loft, adapted to the "Faule Farm", which was one of the several farm-houses belonging the counts Pannocchieschi. Now it has been restored and transformed into a family apartment with a day zone having a large kitchen in local marble, living room with sofa bed and fire-place. There is a specious double room with French window that gives into the garden, a bedroom with twin beds (joinable) and a bathroom with window, box shower in marble with hydromassage. Outside you can find sunshade with table, chiars in marble , a covered sitting place under a secular oak with table, chairs and grill facility, as well as a small size swimming pool which could be heated. Everything is immersed into the green of the Tuscan hills.